With only nine releases to date since the Under the Capricorn Sky split in 2006 between Bosque the enigmatic Senthil, Texas label Pale Horse Recoridings has quietly provided the underground metal world with some of the more unsettling music available on the market. With releases ranging from the aforementioned split to the grandiose funeral doom of Dictator and the distant, cold black metal of Thra'el and Imynvokad, I was more than surprised to see a project the likes of GoatCraft among their ranks. 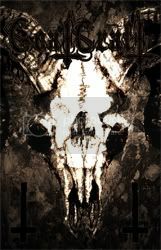 Of course, with a name like GoatCraft and a cover boasting upside-down crosses, a near-illegible logo and a goat skull, one would almost knowingly assume that this is just another raw black metal band to grace Pale Horse's roster, and yet that couldn't be any further from the truth. A meditation in fusing compositional styles, Goatcraft's eponymous debut boasts almost an hour of moody, dark, instrumental piano pieces. These distant, gloomy home recordings feature a medium between the technically proficient and the melodically inclined, with somber melodies that seemingly moan from within otherwise harmonically dense compositions. Though perhaps just as unknown, I can almost draw a comparison to the stark neoclassical piano music of the short-lived Vannvidd, though GoatCraft's music exudes more misery and despair as opposed to Vannvidd's manic, seemingly psychotic temperament. GoatCraft's complex, moody piano compositions are a breath of fresh air in a "scene" otherwise tainted with basement-dwellers playing dark tones on Casio keyboards. This sole musician's proficiency at composing and performing dark, sensuous music shines a bright light, beckoning talented musicians back into the world of darkwave and dark ambient musics. Hopefully they will follow suit. For a mere $4, this limited cassette is definitely worth your time and money. Order it today from Pale Horse Recordings. This is by no means for everyone but those who understand what is presented will find it immensely rewarding.